Ok. I’ve seriously been neglecting my blog. I know, I know. 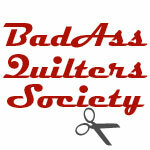 We’re all busy, busy, busy and why should I be any different than any other blogger/quilter/full-time worker?! The problem is once you rationalize that it is ok to skip posting about this quilt, then it’s ok to skip posting about the next one. Then before long, it’s been like 3 MONTHS! Good grief! So, what have I been doing with all this extra blog-free time? Remodeling and adding an addition to the house (see pic below) to accommodate my takeover of the space formerly used for a living room for my longarm frame. I found out the day after my ex-husband died that my kids have a half-sister we didn’t know about (same age as my 2nd daughter, and yes I think I must be a saint too for still hosting the after-funeral dinner after learning about that 35-year-long secret). This seriously caused a lot of stress in an already stressful week of funeral planning. Fighting an URI due to secondary infection from wisdom tooth being pulled. I had a lot of distractions, you might say. 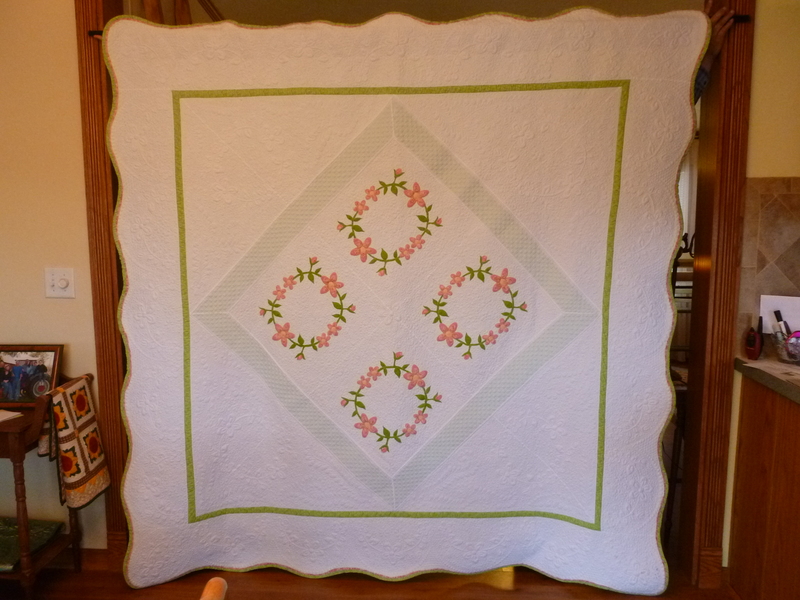 However, I did finish a gorgeous quilt I call Spring Shadows. I love the color and the texture of this quilt. I learned a lot while creating this quilt – and a lot of things to not do on future quilts. This started out on paper as a doodle. 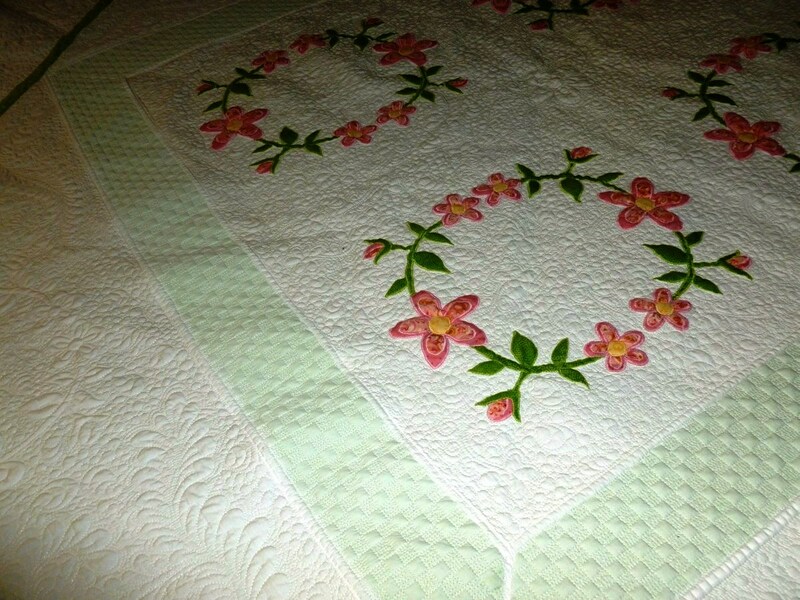 I used the flower motif I doodled as the basis for the applique (machine) and the trapunto. 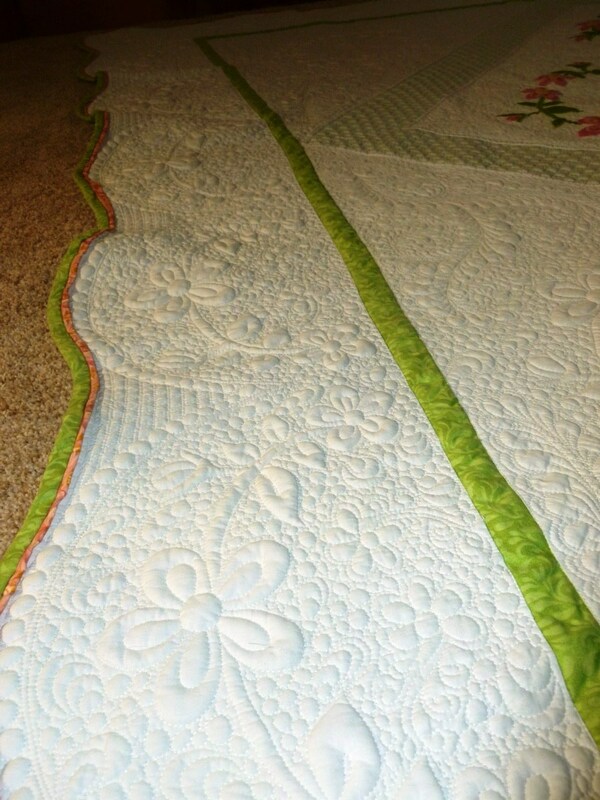 I also used green fleece in the border surrounding the applique (shadow trapunto). I decided that the outer border needed to be white and used the same motif in a modified swag. Then I added a flange to the curved binding. I learned that I need a lot more practice on adding a flange to a curved binding or maybe my process needed to be corrected. I also learned that I should mark the entire quilt BEFORE loading it on the frame. The design I was going to quilt in the middle wound up being discarded and I wish I had marked that area first. I would be a lot happier with this if I had done that. 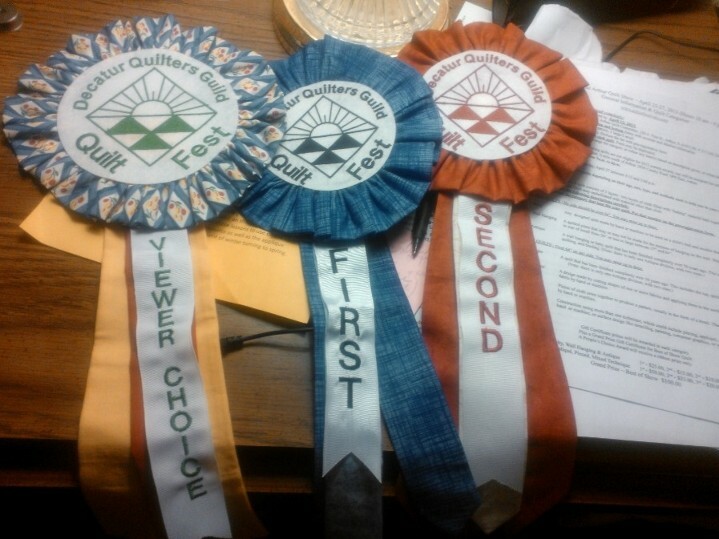 Oh, well, each quilt is only practice for the next one, right?! 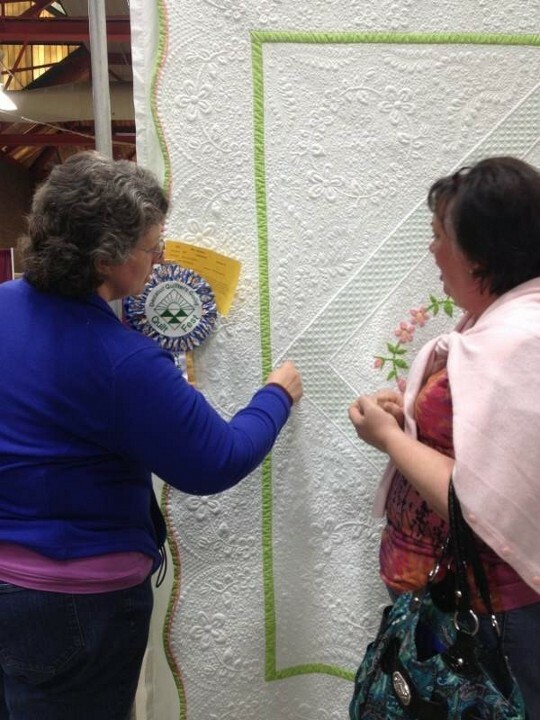 Spring Shadows won 1st place and Viewer’s Choice ribbons at the Decatur Quilt Fest last week, also!! woohoo!! I promise, I’ll post pics soon of other quilts I’ve been working on lately. Looking into the new room. 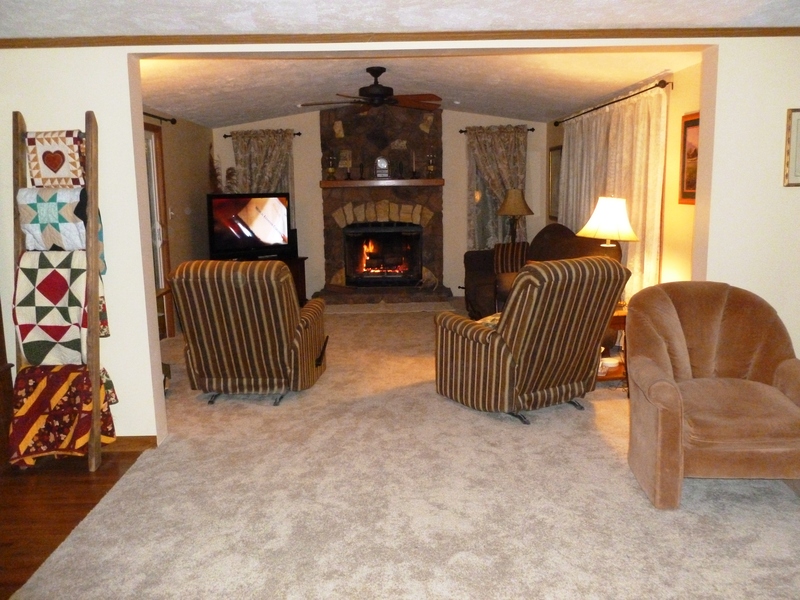 We also removed the fireplace from the old family room, which gave us extra seating room also. Stunning!! 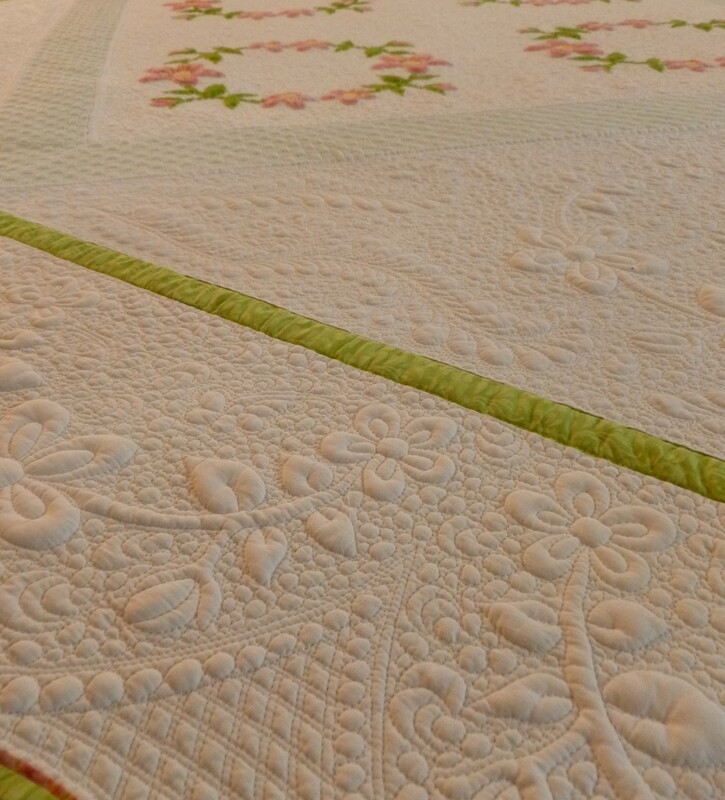 What a great quilt, and your quilting is amazing! Congratulations on your new quilt it is so beautiful. You amaze me girl. You have so much creative talent and skill. Love it!! !